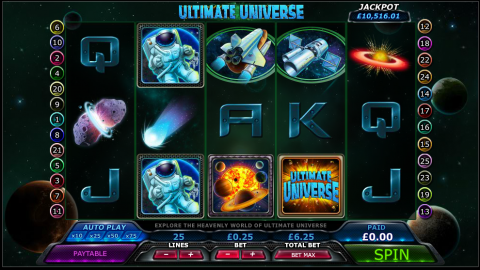 Ultimate Universe Slot is based upon space exploration - with symbols including astronauts, planets, satellites and the space shuttle. This video slot is exclusive to the 888 Casino, and was created by their in-house development team known as 'Random Logic'. When first entering the game you’ll be met by an impressive opening sequence where planets zoom across the universe, until one is exploded by a fast moving comet – all taking place alongside an impressive ‘Superman’ style soundtrack. Having set the scene, you are then transported into the game itself. In this review I examine all aspects of playing the Ultimate Universe slot. First up I explain the basics of the game, including the number of lines and a look at the pay table. I then look at the other features of the game, including the ‘Wild’ symbols and the free spins. I finish by explaining which devices you’ll be able to use to play the game, followed by my final thoughts and details of how to get £88 free play as a new player at 888 Casino to try this game without making a deposit. The Ultimate Universe slot is a 5 reel slot with a maximum of 25 win lines. You’ll be able to choose how many win lines you’d like to play – going as low as just one, which means that just the middle line will be in play. The minimum bet size is just a penny, which will cost 25p if playing all lines. The maximum bet size is £10 – making each spin cost £250 if playing all lines, which might catch the eye of the high rollers. The other option which is customizable is the auto play feature, where you can set the game to auto spin either 10, 25, 50 or 75 times. This game also has a randomly awarded jackpot prize. The size of the Jackpot isn’t quite as high as some of the Jackpot sizes you’ll see, although I don’t know of anyone who would say no to a tidy £10,000 being added to their bank account – this adding to the enjoyment of the game. The best symbol in the game is the astronaut and hitting this symbol all 5 times will payout 2,500 coins – with smaller prizes for hitting the symbol 2, 3 or 4 times from left to right. The space shuttle and the satellite are the next best in the game and also offer prizes for hitting the symbol 2 or more times. The comet, the asteroid and the exploding star as well as the A, K, Q and J symbols are the other ‘standard’ symbols in the game, all of these paying if landing 3 or more from left to right. Additionally, you’ll find the ‘Ultimate Universe’ symbol, this acting as the wild symbol in the game. Any wins achieved using this symbol is doubled, making this better than your standard ‘Wild’ symbol. There is one other symbol in the game – ‘The Planets’ scatter symbol. Hitting this symbol three or more times will see the free spins feature activated. You’ll gain 15 free spins if landing 3 scatter symbols, 25 free spins if landing 4 and a whopping 50 free spins if landing the scatter symbol on all 5 reels. During the free spin round you’ll be able to trigger the free spin round again. This game can be played instantly through your browser using Flash software as well as being available at a download version of your casino. Additionally, Ultimate Universe is one of the games available on the go through a mobile app – the game is available on both Android and Apple devices. This game starts off impressively, the opening animation promising a game full of both action and atmosphere. Unfortunately, the game doesn’t quite match up to this promise. This is mainly due to the lack of features in the game – a simple free spins option available, which you’ll find as standard at many online slots. This game might appeal to sci-fi fans, although there are better games in that genre online. The saving grace for the game however is the jackpot, meaning there is always the potential for that sudden big win – for me this would be the main reason I would return to play again. You’ll be able to enjoy Ultimate Universe exclusively at the 888 online Casino. New players will receive a no deposit £88 free play bonus when joining the site, which will allow you to check out several slots with no risk. What I like about this deal is that you get to keep any progressive jackpots (though cashing out is rather limited for regular wins - so best to think of this as a free trial with jackpot potential!). You can still enjoy the 100% matched welcome bonus + regular offers.